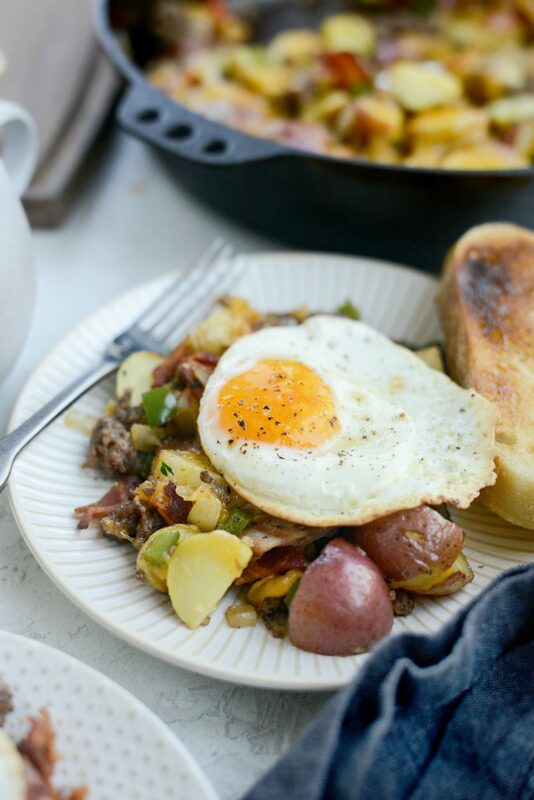 This Farmer’s Breakfast Skillet is comfort food at its best! 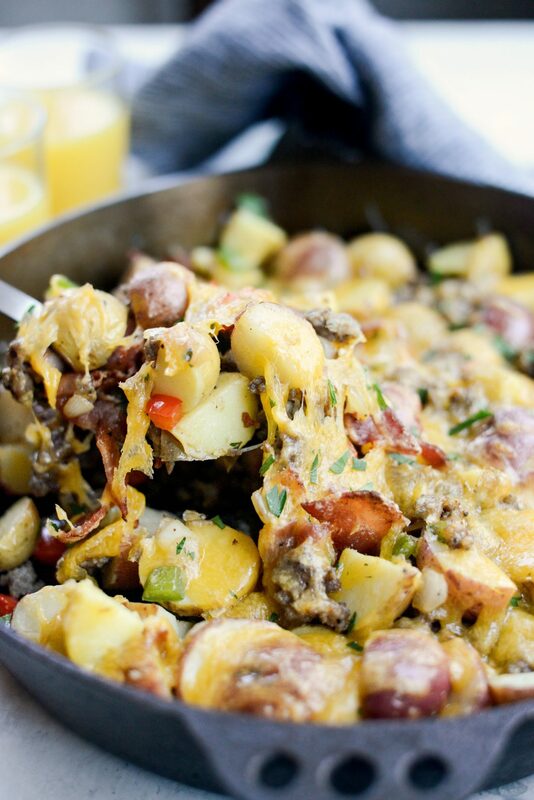 Potatoes tossed with bacon, breakfast sausage, sautéed peppers and onions, garlic and thyme is topped with cheese before sliding under the boiler. Serve with eggs as you prefer them and thick slices of buttered toast. Serves 4 to 6 in about 1 hour and 15 minutes. One tradition Pat and I keep alive and strong, is our Friday morning breakfast dates. Since he works 10 hour shifts Monday-Thursday it leaves Friday mornings (when the girls are in school) for us to enjoy together. Sometimes we stay home and I will make us fried eggs and bacon or a spinach and sausage egg scramble. Other times we take our show on the road and try different diner joints around our area. 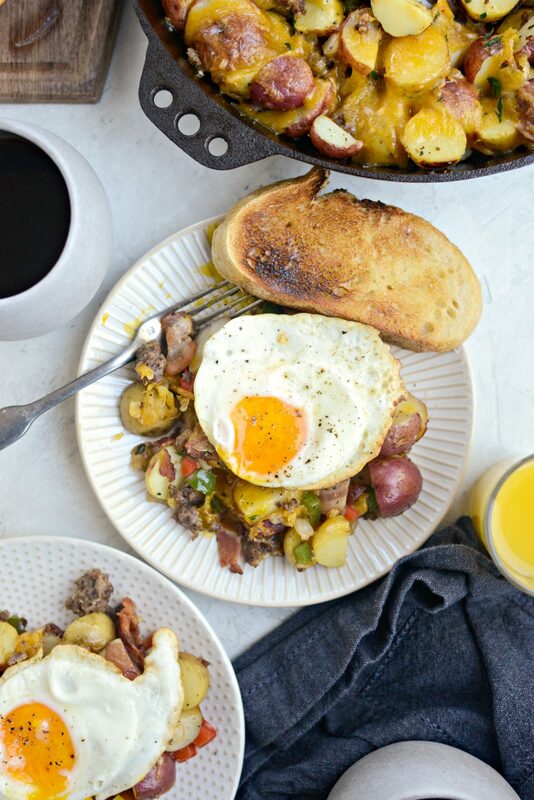 Skillet breakfasts are a trend I see on a lot of menus. I’ve ordered veggie loaded breakfast skillets – usually with an egg on top, hash brown skillets and egg scrambles with just about any add-ins you can imagine. The list goes on. One breakfast Pat and I always agree on and both of us order is the Farmer’s Breakfast Skillet. Depending on where you go, it usually contains hash brown potatoes, a variety of different meats like ham, bacon and/or breakfast sausage, peppers and onions and of course – cheese! We both order it with fried eggs, me with cinnamon raisin toast and him, Texas toast and the only difference is Pat will get his smothered with sausage gravy. Which isn’t a terrible idea. 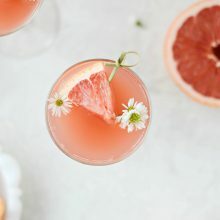 After ordering it so often, I decided to spread the love and create a recipe that could be made at home on the weekend. 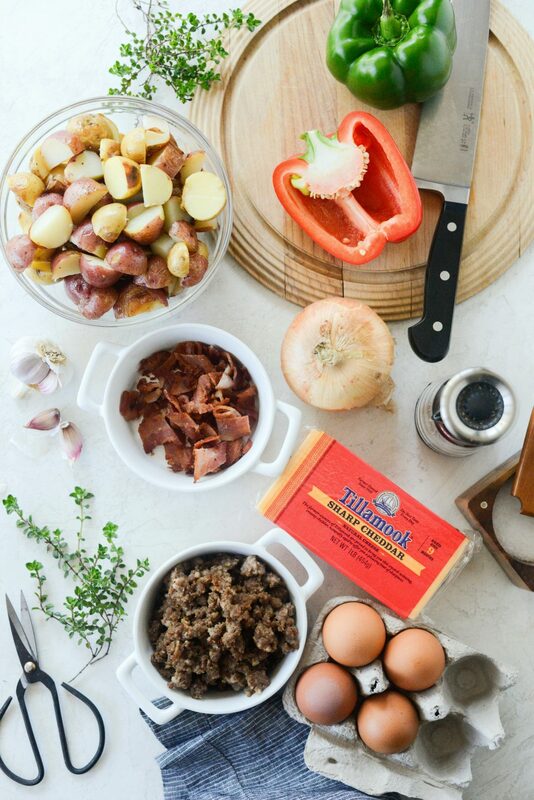 In sponsorship with Tillamook cheese, my version of a Farmer’s Breakfast skillet has roasted potatoes, sautéed bell peppers and onions, browned breakfast sausage and crispy pieces of bacon. I also snuck in a little garlic, fresh thyme and the usual salt and black pepper for a extra flavor. Lastly topping the whole thing with grated sharp cheddar cheese (thanks Tillamook!) and sliding it under the broiler. 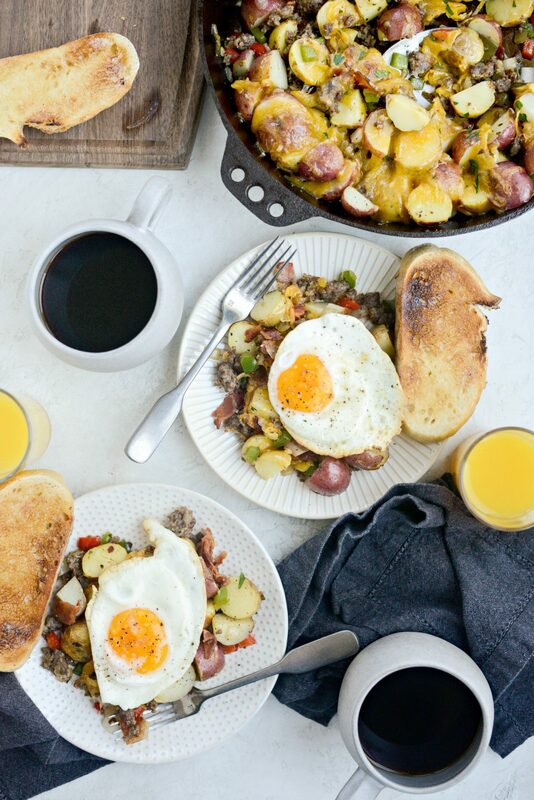 This farmer’s breakfast skillet makes quite a bit so it can feed a large family or small gathering. Definitely a satisfying breakfast that’s sure to fill you up. 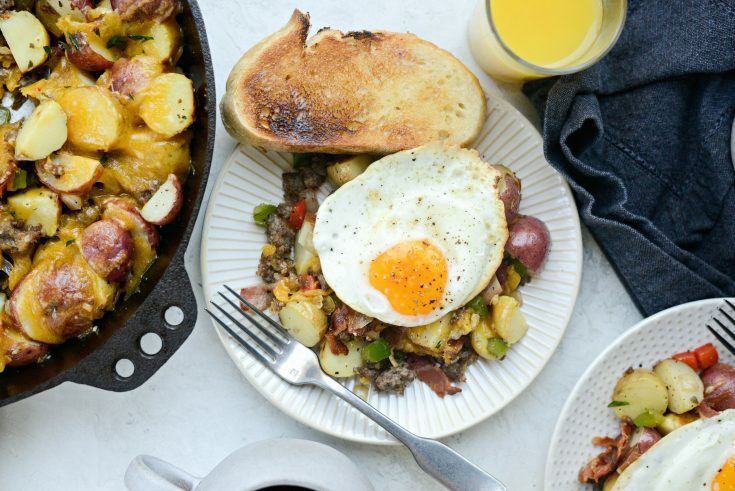 Since there’s indeed a bit of prep work involved, this skillet breakfast is best made on a morning you have time and not when you’re pressing to be somewhere. 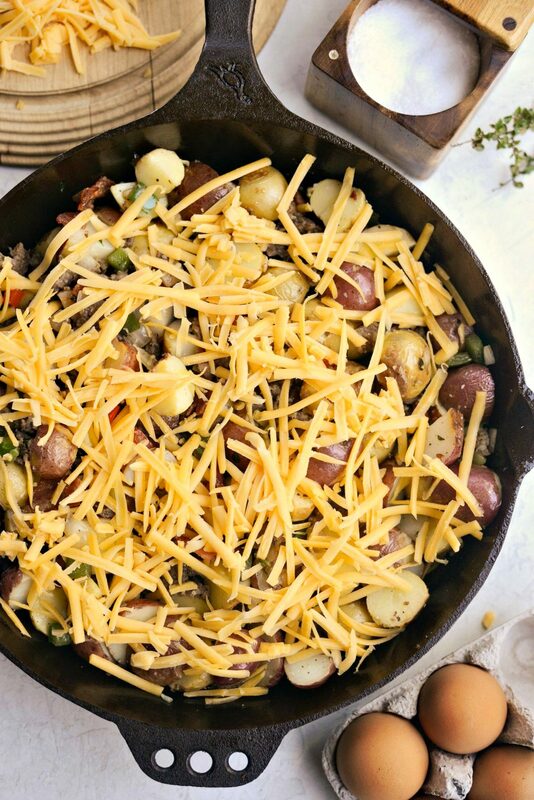 For this recipe you will need: 2 pounds of small baby potatoes, bacon, breakfast sausage, green and red bell peppers, a yellow onion, fresh thyme, garlic, s & p, sharp cheddar cheese. Eggs and toast are for serving and are optional. First toss 2 pounds of baby potatoes in about 2 tablespoons of olive oil and seasoned them with a pinch of kosher salt and freshly ground black pepper on a rimmed metal baking sheet. Then slip them into a preheated 400° oven to roast for about 30 to 40 minutes or until tender when pierced by a fork. Rotate the pan halfway through to ensure even cooking. 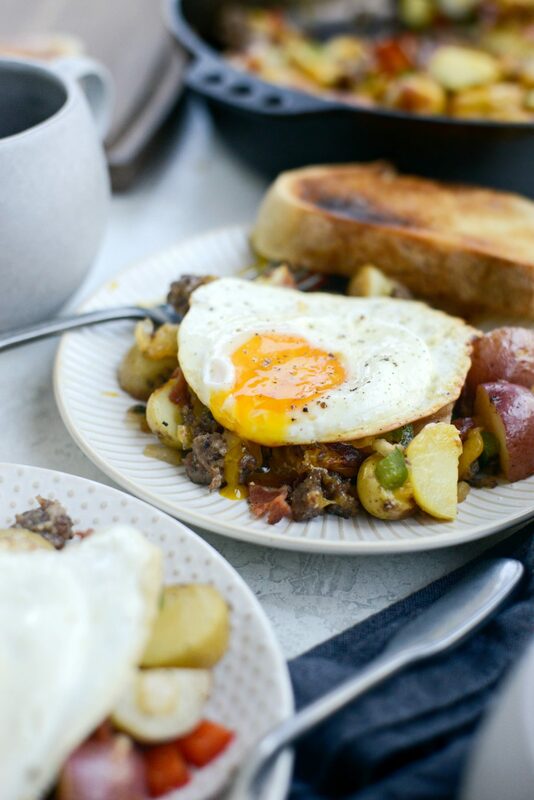 Remove and allow to cool while you prepare the rest of the farmer’s breakfast skillet. Once cool cut in half or quarter. In a 12-inch cast iron skillet, place 4 strips of thick-cut bacon and heat to medium-low. Slowly rendering out the fat and cooking until crispy. Transfer the cooked bacon to a paper towel lined plate to drain and cool, then coarsely chop. 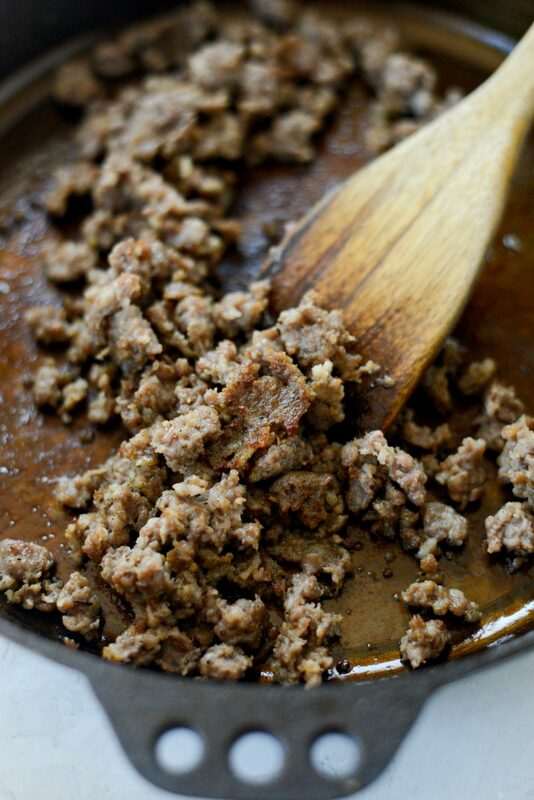 Drain out all of the bacon fat into a heat safe bowl and add in a 1/2 pound of breakfast sausage to the skillet. Use a wooden spatula to break up the pork and cooking until browned and no longer pink. Use a slotted spoon to transfer the cooked sausage to a bowl. Next add in the 1/2 cup of both red and green bell peppers (diced) and season with a pinch of kosher salt and freshly ground black pepper. Stir occasionally until softened, about 5 to 8 minutes. Next add in a teaspoon of chopped fresh thyme leaves and a small clove of minced garlic. Cook for 1 to 2 minutes or until fragrant. 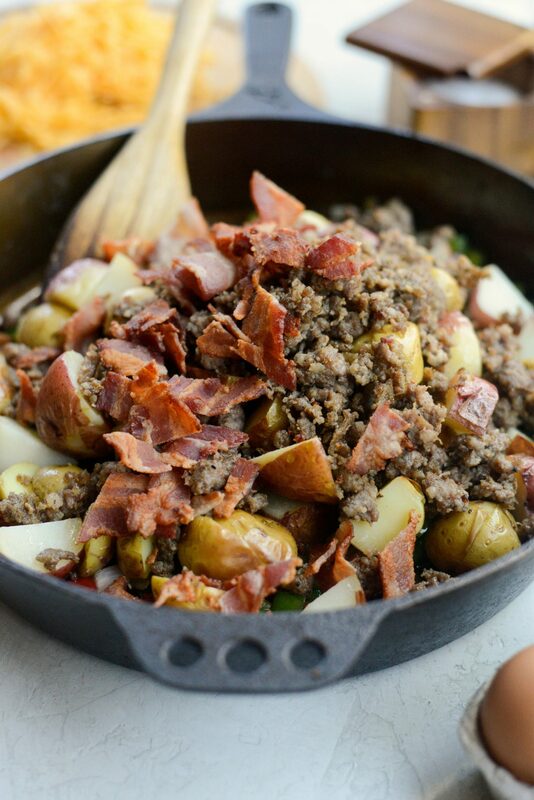 Then add in the cut potatoes and all of the crispy bacon and sausage. 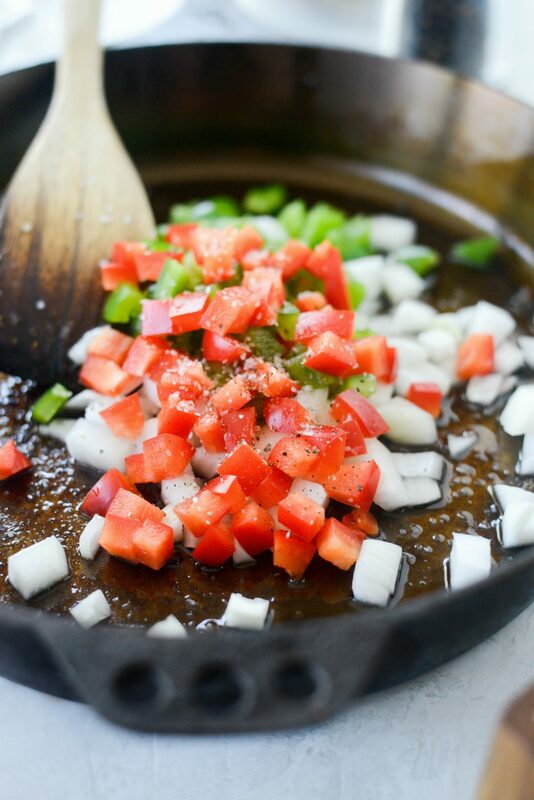 Stir to distribute evenly and spread into and even layer in the bottom of the skillet. Move your oven rack to the highest position in your oven and preheat your broiler on high. 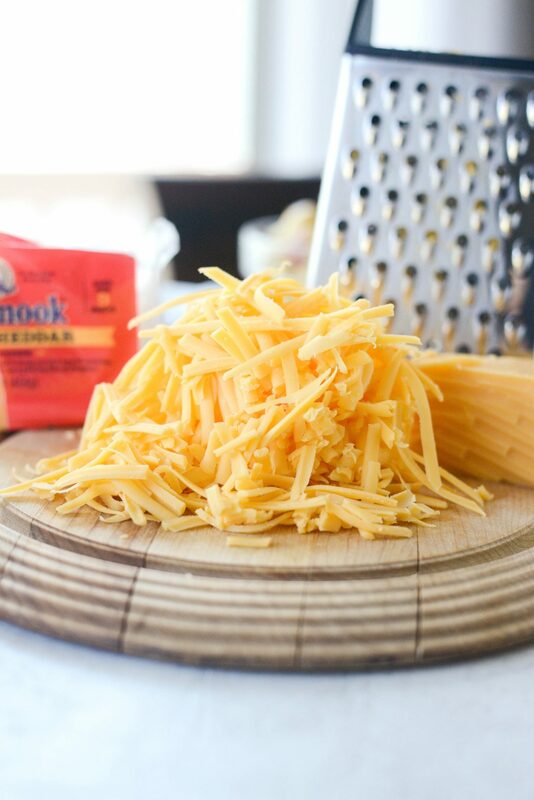 Grate a heaping cup of sharp cheddar cheese on the large holes of your box grater and sprinkle it evenly over top of the hash. Slide the skillet under the broiler until the cheese is just melted. This only takes a minute or less, so keep a close eye on it. The cheesy edges near the parameter of the pan get crispy (<—my favorite part) while the center is ooey-gooey. Yum! Top with an egg (or two!) cooked to your preference (fried, poached or even scrambled) and serve with coffee and orange juice. We like to pile this on toast as we eat it so thick slices of toast are a total must. 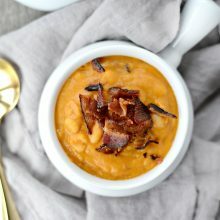 Comfort food at it’s finest! Simple and straightforward but deliciously filling and flavorful. 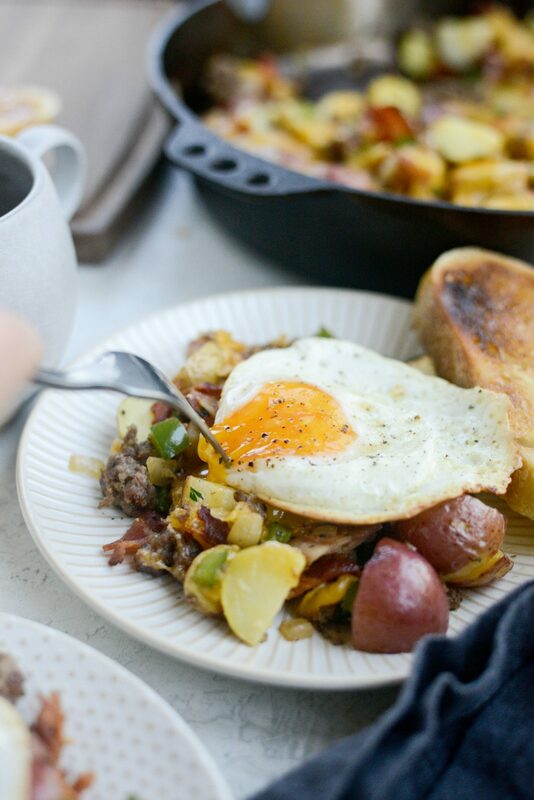 This farmer’s breakfast skillet also makes for excellent leftovers for the next morning. Now, all that’s left to do is poke that yolk and devour. Enjoy! 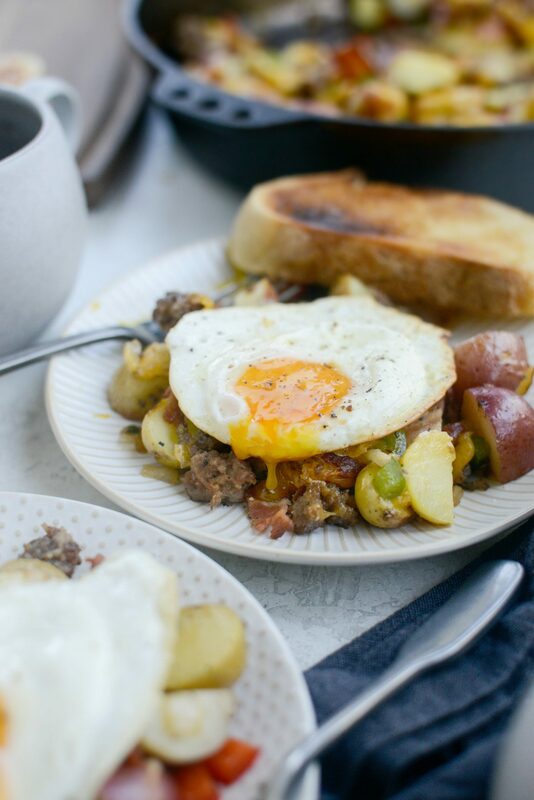 And if you give this Farmer’s Breakfast Skillet recipe a try, let me know! Snap a photo and tag me on twitter or instagram! 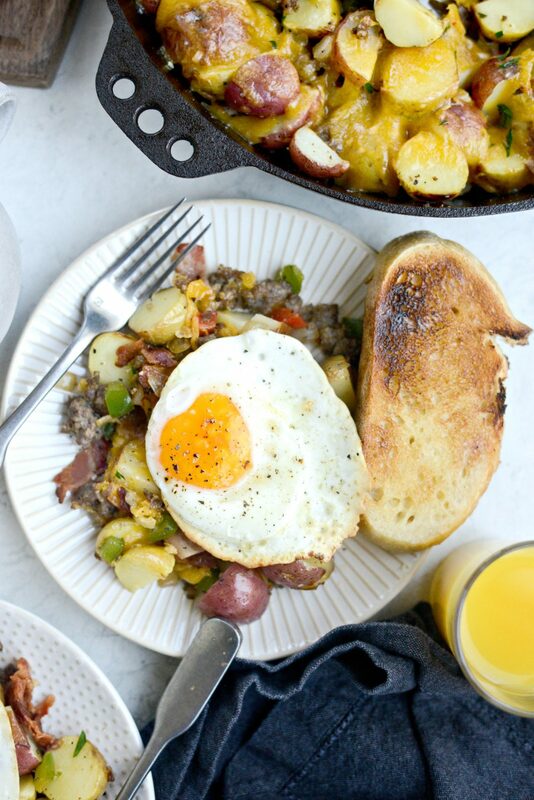 Farmer's Breakfast Skillet is comfort food at its best! 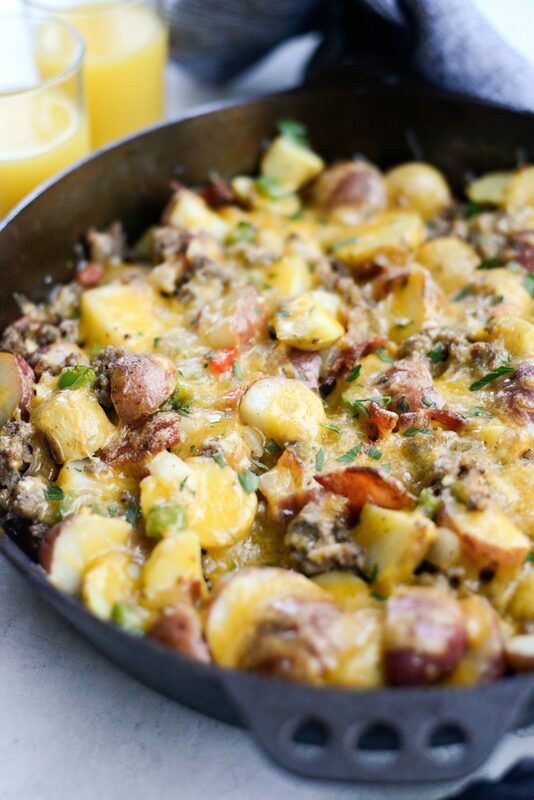 Potatoes tossed with bacon, breakfast sausage, sautéed peppers and onions, garlic and thyme is topped with cheese before sliding under the boiler. Serve with eggs as you prefer them and thick slices of buttered toast. Serves 4 to 6 in about 1 hour and 15 minutes. Preheat your oven to 400°. 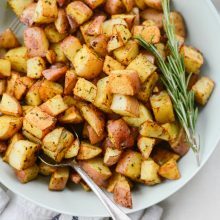 On a rimmed metal baking sheet, toss 2 pounds of (whole) baby potatoes in about 2 tablespoons of olive oil and seasoned them with a pinch or two of kosher salt and freshly ground black pepper. Then slide them onto the middle rack of your preheated oven to roast for about 30 to 40 minutes or until tender when pierced by a fork. Rotate the pan halfway through out roasting to ensure even cooking. 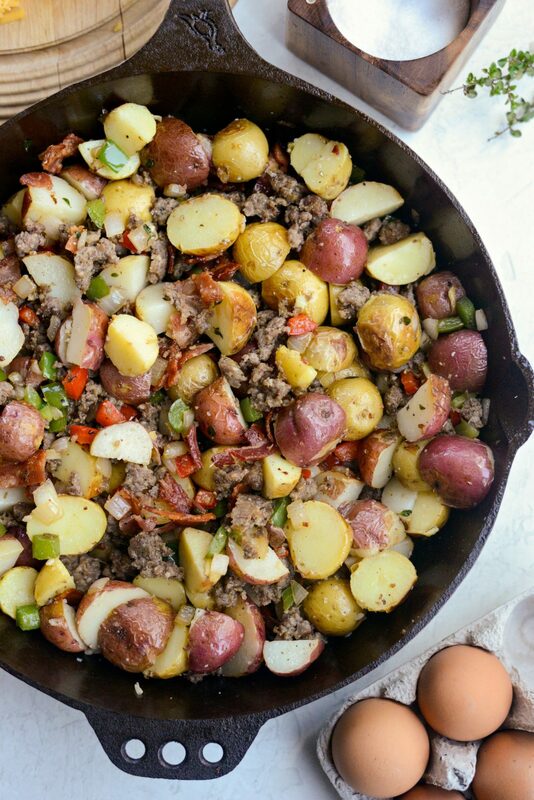 Remove and allow to cool while you prepare the rest of the farmer's breakfast skillet. Once cool cut in half or quarter if large. While the potatoes roast, prep the remaining ingredients and start on cooking the bacon and sausage. In a 12-inch cast iron skillet. 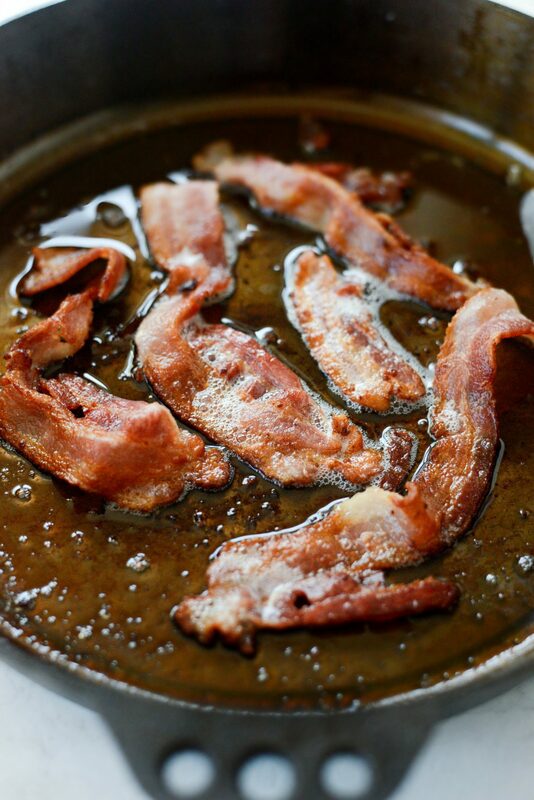 Cook the bacon until crispy, then pour the bacon fat into a heat-safe bowl and set off to the side. Next add in the breakfast sausage, using a wooden spatula to break it up into small crumbles. Cook until browned and no longer pink. About 10 to 12 minutes. Use a slotted spoon to transfer the cooked sausage to a clean bowl or plate. 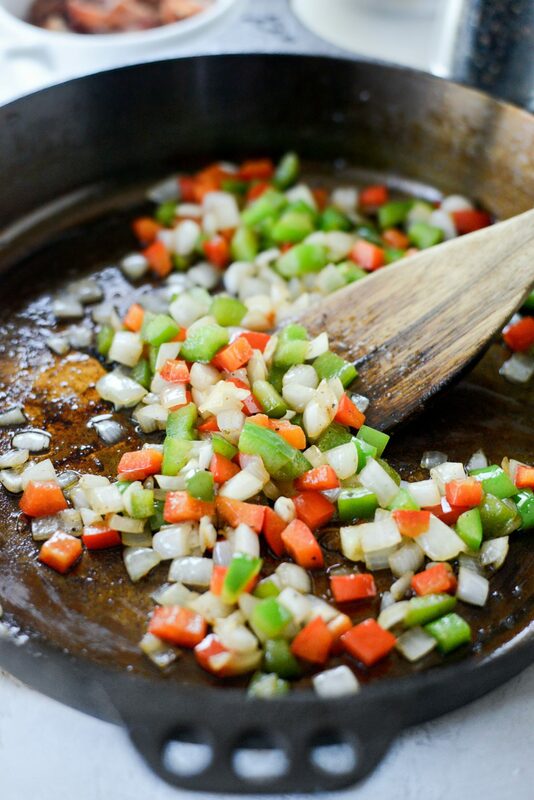 Then sauté the peppers and onions with a pinch of kosher salt and freshly ground black peppers until tender. About 5-8 minutes. Adding a teaspoon or more of the bacon fat back to the skillet as needed. 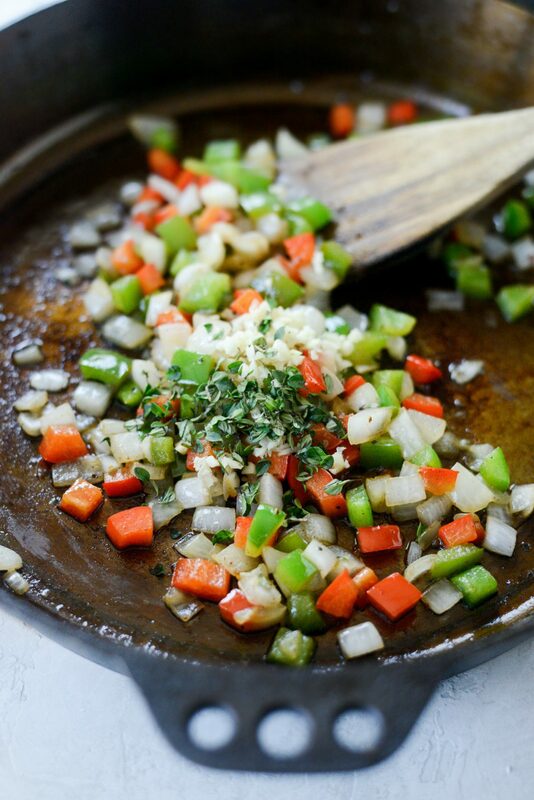 Add in the minced garlic and thyme, cooking for an additional 1 to 2 minutes. Move your oven rack to the top position and preheat your broiler on high. Add the cut potatoes, cooked bacon and sausage back into the skillet with the peppers, season with a couple more pinches of salt and black pepper and toss to combine. 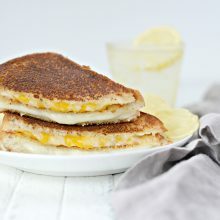 Spread the hash into an even layer and sprinkle with sharp cheddar cheese. Slide the skillet under the broiler until the cheese has just melted. 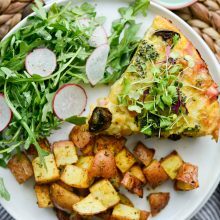 Remove and serve onto plates as is or topped with an egg of your choice (fried, poached or even scrambled) on top and with a slice of buttered toast. 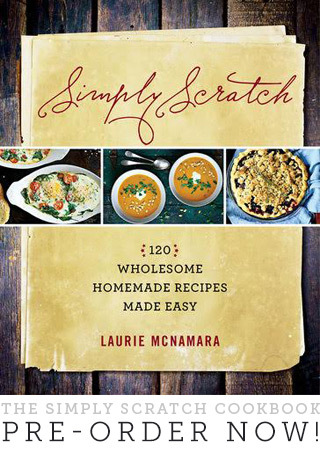 **I have a recipe for homemade breakfast sausage in my cookbook. This post is indeed sponsored by Tillamook. As always, my thoughts are my own and I love their products – especially their cheeses and rocky road ice cream. Love, love, love breakfast! And that looks REALLY mouthwatering. That looks amazing I will be trying it soon! I’m going to try my mom’s tip on hash browns to cut down on time waiting for potatoes to cook. 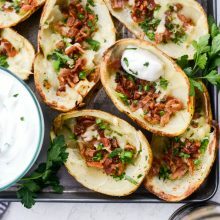 She cooks extra baked potatoes the night before with dinner, then puts them in the fridge overnight. Peel (or don’t) the skin off in the morning, chop up to your liking and fry in a pan with some olive oil and salt until browned. They are perfectly crispy and cooked.